I haven't had much time for blogging lately, but that's not because we've been sitting around the yacht club bar. I'm happy to say that Petronella's 'restoration' has begun! I put 'restoration' in quotes, because in the wooden boat world, a restoration would mean rebuilding. 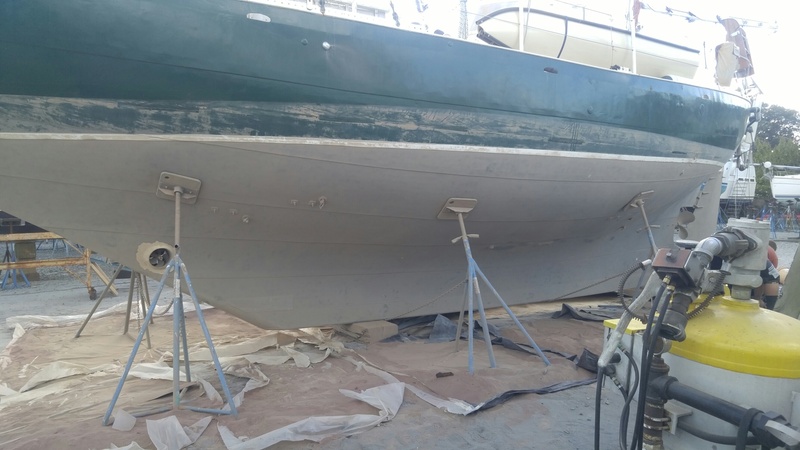 Petronella is in good physical shape, so there won't be much rebuilding; however, we are restoring her paint system in two significant ways. First, P's bottom paint was in pretty poor shape. Before we left Florida, we had a diver clean it, and he reported layers of paint peeling off in certain places. That got our attention, and got us thinking about doing work on P sooner, rather than later. Second, as discussed in a previous blog post, we wish to restore Petronella's original, historical 'look'. This is the kind of job Helena and I would have done on our own in the past. In fact, we did do it on our own with the Blue Moon. However, we quickly decided that this time the job was too big for us. Several reasons for this: P is much bigger than the BM, and it would take significantly longer. Frankly, we'd rather be cruising in the Bahamas, than scraping and painting all winter. Call that lazy if you want to! But mainly because, to do it right, the job requires special tools and techniques. Since the last bottom job lasted 40 years, we figured it would be 2056 before we needed those tools and skills again. So we hired Howdy Bailey to do it, and even Howdy considers soda-blasting to be a special skill. He brought in a specialist to do the work. First, they wrapped the bottom to contain the dust. Here you see the blasting in action. The plastic billows out from the air being pumped into the enclosure. And below is the result. The bottom paint is gone, including about 3 inches of the original boot-stripe. 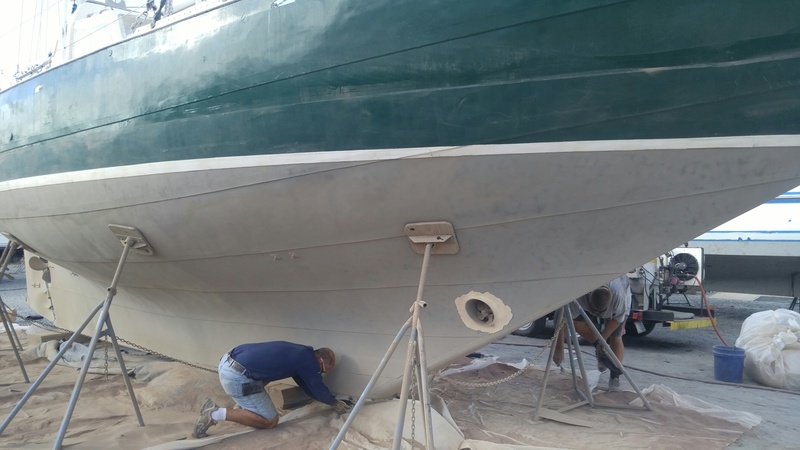 The waterline needed to be raised to eliminate the constant scum line on the boot stripe. An improvement that I will really appreciate. Another view of the bottom. 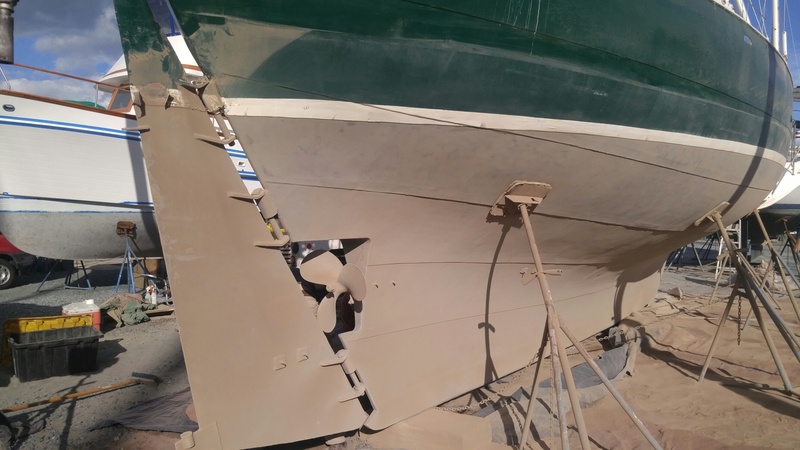 Special attention was given to the bow thruster, to ensure it was not damaged during the soda blasting. The goal was to retain the original coal tar layer on the bottom, but this turned out to be impossible. Howdy had already discovered that water had gotten under the tar in certain places, which was causing it to delaminate. In the end, the tar was too far gone to keep, so we are back to bare steel again. Bare steel can't stay bare very long, or it will begin to rust, so a primer coat was put on immediately. First coat of primer on. I don't know about you, but I think she looks great. Before stripping, P's bottom had that cratered look many old boats have. Now, her bottom is as smooth as the day she left the Meta factory in France, 40 years ago. So, excellent progress from Howdy and his crew. We are very excited about it. I will keep you informed as the work progresses! As far as I can make out, it’s just a very fine sand.